" JAKE AND BEN" HAVE MANY NEEDS... AND NEED YOUR HELP! Thank you to all who wish to help Jacob and Benjamin Swomiak. 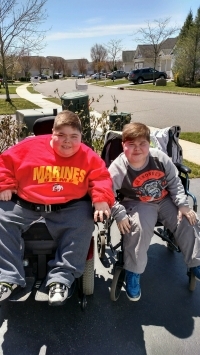 Both boys suffer from Duchenne, Muscular Dystrophy (DMD), the most common lethal childhood disorder that strikes one in every 3,500 boys worldwide (girls are usually carriers). Roughly 35% of all cases occur in families with no previous history of DMD, as is the case in Jake and Ben's family. So it can happen in any family. Because their young bodies cannot produce the protein "Dystrophin", they are unable to protect their muscle cells and over time their muscles waste away. DMD is generally diagnosed at approx. 4-5 years of age and by 10-12 most boys require the use of a wheelchair. As DMD progresses it affects the heart and respiratory system and other muscles throughout their body. Research has provided some hope but at this time there continues to be no cure and most boys lose their battle with the disorder in early adulthood. Their mom raises her boys alone. They recently moved from Jackson, NJ to a little bigger apartment in Toms River, NJ. Jake is now 20 years old and has been in a wheelchair since just before he was 11. Ben is 17 and lost his ability to walk when he was 15. The family must purchase special needs equipment, services etc. to meet the boys ongoing mobility and medical needs. Numerous expenses are not covered by insurance, therefore, we are asking everyone to please consider a gift to help the boys obtain the things they need. If you would like to make a monetary gift online please click on the "Make a Donation" tab. "Jacob & Benjamin Special Needs Fund", PO Box 67, Millstone Township, NJ 08510. (This is not a tax deductible gift). Who is Jacob & Benjamins Favorite Superhero?